The developed world is on its way to recovery after years of wrenching recession and austerity, but it still has a long way to go and it is not getting there fast enough. At the current pace of recovery, with stubbornly high unemployment rates, lacklustre growth in consumption and limited corporate investment there is little pressure on inflation. At the same time, China is now growing at more modest rates compared to the previous decade, and as the dragon goes from a run to a jog, so does its hunger for commodities, further dampening inflation expectations. To the great surprise of market watchers everywhere, oil prices have been on a free fall since June this year, from $115 at its peak to $83 as October draws to a close. Over supply from OPEC countries in need of cash after years of instability, America’s fracking bonanza, and new opportunities elsewhere are mostly to blame. In contrast, low demand stemming from a slowly recovering global economy can’t just keep up with the oil flood, and since both trends will continue growing apart in the foreseeable future, so will oil keep getting cheaper, knocking down prices in numerous industries and thus slashing costs everywhere. 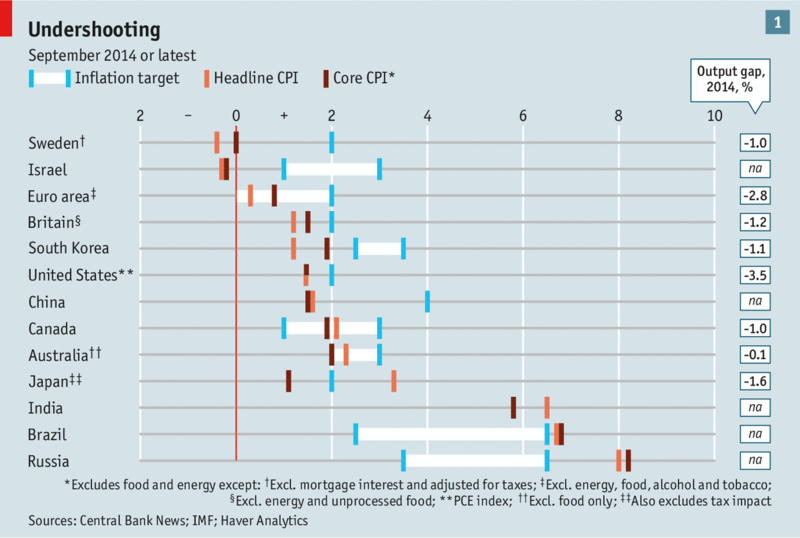 As limited growth and cheaper oil force down prices across the world, Central Banks in developed countries find themselves unable to push inflation back to their official targets, having already driven their official interest rates close to zero. 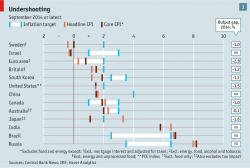 After giving up Quantitative Easing, the only remaining tool to re-ignite inflation with cheap money, America’s FED has lost the reins on inflation, while the ECB has failed to react fast enough and even China’s People’s Bank remains silent at having missed its target of 4% by half the rate. Now that the watchmen have left the field, there is nothing to prevent prices from tripping into a downward spiral. Such is the magic of the markets is that if enough people expect something to happen, it will happen one way or another, and everyone is expecting inflation to keep falling. Whether it is worries about Europe, a slowing China or the current oil bonanza, the markets are awakening to the realities of a world of falling prices. As expectations are built up into bonds and futures, firms hold down investments and consumers delay purchases, it will all make deflation a reality out of flagging demand. Barring an unexpected hike in oil prices, markets will keep looking down the whirlpool of deflation, and in doing so, forcing prices to ever lower levels. 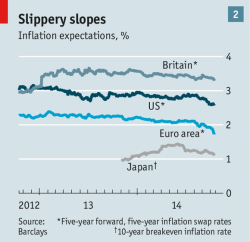 How should we handle low inflation in our portfolio? Get comfortable with lower returns. For example, a nominal return of 4-6% yield for buying a corporate bond and holding to term is not too bad now that inflation is bouncing around 1%. You are still going forward in real terms. You should avoid Inflation Indexed assets. 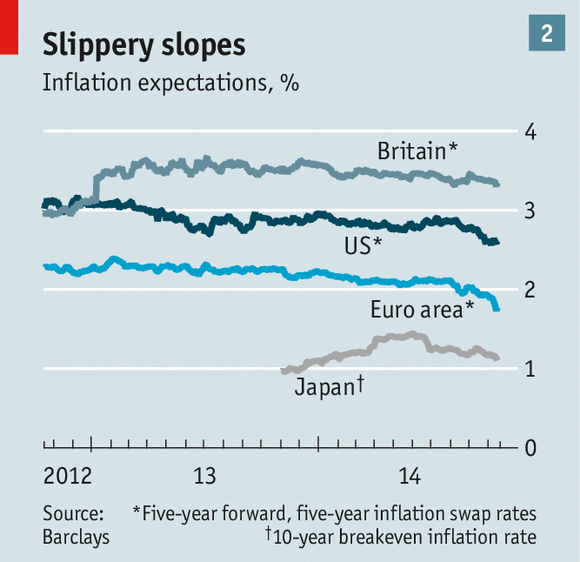 You will pay more for inflation hedged bonds for little reason. Avoid Commodities: flagging demand and plentiful supply will likely keep their price levels depressed for a few years. Consider Real Estate Trusts. With low interest rates likely for a while, real estate trusts will benefit both from lower debt costs and from the increasing attractiveness of their yields. Keep an eye on the Medium Term. Low inflation is here to stay for at least the next few years, but chances are high that it will eventually return to the average in the long run. The thing to watch is capacity utilisation numbers which indicate that pricing pressure is around the corner.